Mexico's top-rated Casa Colina located near Puerto Vallarta pampers families with their own private chef and staff, on-site infinity-edge pool, and access to an assortment of nearby attractions that will wow kids of all ages. Isla Navidad, Mexico – Families looking for that perfect getaway this summer are booking their vacations at the ultra-lux Casa Colina! Casa Colina is perfect for the entire family. At Casa Colina, kids can enjoy snorkeling, diving and horseback riding and parents can be pampered by their own personal staff. • Laguna Suite: Master bedroom suite with a California King bed, shower, Jacuzzi tub, private garden, breakfast table, and plush loungers. • Sueno Suite: Master bedroom suite with a California King bed, shower, Jacuzzi tub, outdoor shower, and private garden. • Oceano Suite: Master bedroom suite with a California King bed, shower, and a walkout balcony. • Luna Suite: Master bedroom suite with a California King bed, shower, and a walkout balcony. • Estrella Suite: Junior bedroom suite with a California Queen bed, shower, Jacuzzi tub, and walkout balcony. • Vista Suite: Corner bedroom suite with two queen beds, shower, Jacuzzi tub, and a walkout balcony. • Expansive outdoor terrace area with infinity-edge pool, blue-tiled Jacuzzi, gourmet BBQ and plush lounge chairs and umbrellas. • Surround-sound home theatre with a 65” Panasonic plasma TV, satellite receiver and DVD player. • Fitness center with state-of-the-art machines and fold-back windows with views of the ocean and mountains. Chilled towels and water are also available. Nightly rates to rent the private Casa Colina villa, which is nestled high above the turquois waters of the Pacific Ocean, include a low-season rate this summer, through September 30, 2012, of $2900 per night, as well as a mid season rate October 30, 2012 – November 30, 2012 of $3800 (this rate is also offered February 1, 2013 – April 30, 2013) and a high season rate of $4900 December 1, 2012 – January 31, 2012. Rates include airport pickup and drop-off, chef, staff, laundry but exclude food, beverages and phone, which are charged at actual cost without markup. A 50% deposit to secure booking is required. Balance payable 14 days prior to booking. Security and provisioning deposit equivalent to one night’s rate. 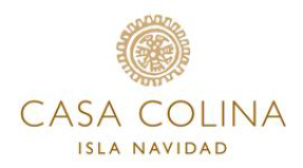 Casa Colina also offers a 5% discount per room not needed. So, for example, if a group only had eight people in their party and required four rooms, they would get a 10% discount (5% per room). • Snorkeling, diving and fishing in the sea. Families can also kayak and horseback ride along the area’s miles of unspoiled beaches and breathtaking lagoons. • Visiting the five million-year-old Colima volcano. • Touring the quaint town of Barra full of local flavor and authentic shops, as well as seeing the surrounding areas including the famous Playa La Audiencia on Santiago Peninsula (the beach where Bo Derek’s movie “10” was filmed). • And golfing at the nearby AAA four-diamond Isla Navidad Grand Bay Resort where families can also play tennis and horseback ride and much more. For dinner, mom, dad and the kids can return to Casa Colina for sunset cocktails and hors d'oeuvres arranged by the villa’s staff and then enjoy a specially made dinner in one of Casa Colina stunning dining areas, including the chic indoor/outdoor Top of the World Palapa with a custom-built Estrella chandelier, fully-stocked bar and 250-degree views of the mountains and ocean and the Lagoon View Lounge with a hand-laid brick cathedral ceiling and Balinese furnishings. After dinner, Casa Colina’s staff can set up the villa’s entertainment system to play music out on the patio by the pool or they can pop in a movie for the family to enjoy Casa Colina’s surround-sound home theatre with a 65” Panasonic plasma TV. For more information about Casa Colina and planning an unforgettable family getaway this summer, including a last-minute vacation, visit www.casacolinamexico.com or call 312-961-3280. Casa Colina is located on the Pacific Coast of Mexico, between Acapulco and Puerto Vallarta, in one of Mexico’s safest states, Jalisco.